SAVE! Get the 2-Book Bundle! Click here! Format: This book is a PDF file, delivered via download. "I love Nick's new Keep Your Salary Under Wraps. It worked for me. Nick gave me the same advice that's in the book when I was negotiating a job offer several years ago. Despite both the headhunter and the company insisting I disclose what I was getting paid at my old job, I stuck to my guns and I was able to DOUBLE my salary. Plus I got a signing bonus. That would have never happened in a million years if I had caved!" 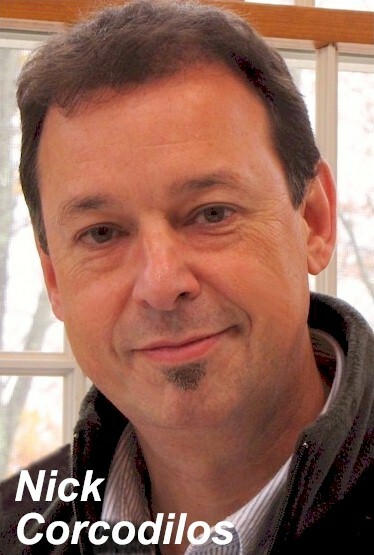 "Nick Corcodilos is the brutally honest, forthright and insightful headhunter who serves up tough love to job seekers while taking job boards and others to the woodshed." might be the worst mistake you ever make! Who says your salary history is anybody's business? Can disclosing your salary cost you a big raise? How can you prove you're worth more? How can you say NO... and get the best possible offer? 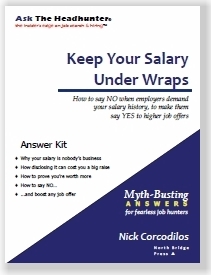 Keep Your Salary Under Wraps is about how to get paid what you're worth, without letting an employer use your old salary to cap a job offer. Learn how to deal with job application forms that require salary history. Put salary surveys in their place—where they can't hurt you. Recognize the junk logic behind price fixing that keeps job offers low. Unless you know how to say NO just the right way, any new job offer you receive may be limited unnecessarily by your salary history. Avoid the salary gotcha that can get you fired on day #1. Learn how to say NO to demands for your salary history. Prove your value, to get hired at the highest possible salary. Don't let employers set you up for low job offers! Do employers ask for your private salary history information before they even interview you? 24 pages of insights and insider tips that expose, explain, and counter the methods employers use to control salary negotiations and minimize job offers. How do decide how much money to ask for. How to deal with "the salary hammer" (salary surveys that employers invoke to keep job offers low). How to turn HR "rules" about salary into a negotiating weapon. The words you need to defend yourself. How to say NO to demands for your salary history. Lead with your value when you apply for a job—not with your old salary. Be ready to show how you will do a job profitably, and make an employer judge you by what you can do—not by how much someone else paid you! This is a must-have guide for fearless job hunters who want to know how to Keep Your Salary Under Wraps to get ahead! Another employer demands your salary history? > Your salary is nobody's business. > Disclosing it can cost you a big raise. > Learn how to say NO... and boost any job offer. Can you afford not to know how to Keep Your Salary Under Wraps? Just $12.95. Get an edge now! Copyright � 2015 North Bridge Group LLC. All world-wide rights reserved. Ask The Headhunter�, the ATH logo and other ATH titles are trademarks of North Bridge Group LLC.